Prophet VS SYSEX Sound Sets contain 100 programs & waveforms. Install 100 programs & waves into your Prophet VS memory via MIDI SysEx files from any of the 6 Prophet VS sound sets available for $19.97 each. Select any of the six (6) Sound Sets of VS Programs available, each Sound Set contains 100 Prophet VS programs. Get all six (6) VS Sound Sets for $99. Click this BUY NOW button. All VS Sound Set SYSEX files are sent to your PayPal email address. VS RAM cartridges are NOT in-stock at this time. 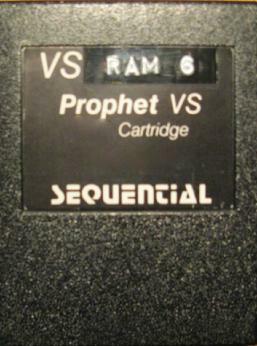 Each Prophet VS RAM cartridge can STORE 100 programs and 32 waveforms. Every Prophet VS has a cartridge port, but you need a VS Sound Cartridge to access 100 internal sounds PLUS 100 cartridge sounds at the touch of a button. You can also save & back-up any special Prophet VS programs & waves to a VS RAM cart.